No assembly foam wall spill berms prevent ground contamination. Prevent contamination of ground, soil and plant floors with an easy to deploy foam wall containment berm. 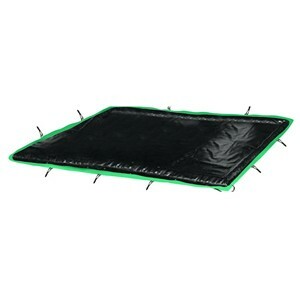 These foam wall models deliver an ultra-containment berm system with fast and convenient set up. They are available with 2" or 4" walls in wide variety of standard sizes and lengths for smaller spills to large volume containment. The built-in, low profile design of the foam side walls are ideal for use with portable drums or equipment maintenance. The collapsible walls compress to load in vehicles yet quickly rebound to capture nuisance leaks. This secondary containment solution meets SPCC and EPA container storage regulations. 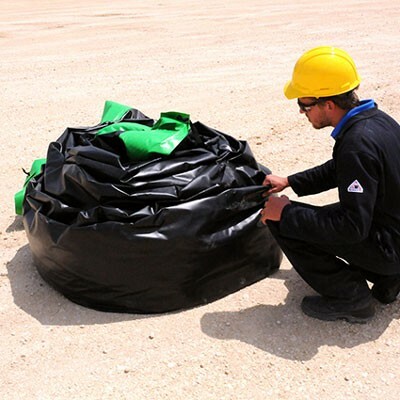 Our spill containment berms are a perfect option for a variety of industries including oil, gas, or construction applications as well as smaller spill zone sites. 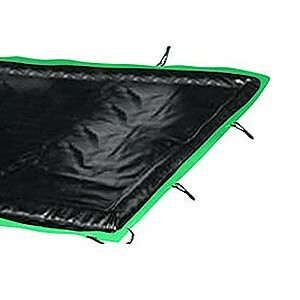 Constructed with heavy-duty Copolymer-2000 or PVC materials, these foam berms are suitable for rugged use in the field. The PVC berms offer a small reduction in both price and weight compared to Copolymer berms. A link to the chemical compatibility for both material types is available under Technical Information below. Our spill berms are available in either 2" or 4" side wall heights. The walls' sturdy foam blocks are encased and heat-sealed within the outer membrane materials to prevent exposure to fuel or other chemicals. This simple design not only ensures secure walls and quick deployment, but means you never have to worry about lost or replacement parts. 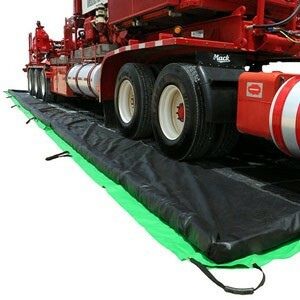 The flexible berm materials compress and also allow some "give" when loading or off-loading, with excellent tear strength and puncture resistance. This makes them suitable for use on a variety of terrains, including compacted surfaces like asphalt as well as softer ground like sand, soil or gravel. Tankers, trucks and other vehicles or wheeled equipment can easily pass over the foam walls which quickly rebound to shape for optimal liquid containment. Optional Ground Mat tarps and/or Track Belts may help increase the lifespan of your berm, and return on investment. 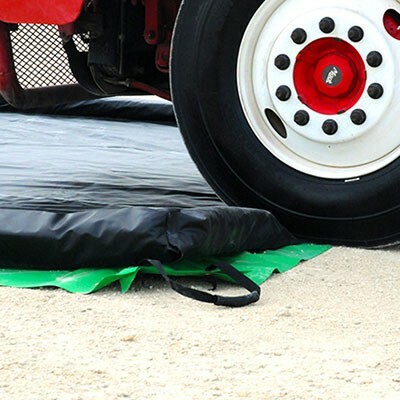 Ground mats offer additional protection against damage and punctures from rocks or debris under the berm. Use Track Belt material strips to prevent wear and tear from tire abrasion by heavy vehicle traffic driving across the berm membrane. Foam wall berms are especially easy to situate. The built-in handles allow for easy transportation and placement for effective spill response. Simply unfold or unroll anywhere on site for your indoor or outdoor spill containment needs. Once they are in location, there is no additional assembly or support system necessary. The berms are ready for short or long-term service to prevent environmental pollution from leaks. Foam wall model berms also allow for installation of an optional drainage system (sold separately) if necessary. These fittings may be of use for spill containment berms in external locations with exposure to rainfall. A drain can also assist emptying the berm following large volume containment activities, like a vehicle or equipment wash stations. After cleaning, the units can be refolded or rolled prior to re-use. The berms' all-in-one design takes up minimal storage space. The 2" foam wall berms hold a lesser capacity of 25 to 88 gallons but are very convenient and versatile to use. The smaller footprint of 4, 6 or 8 feet wide by 6, 8 or 10 feet long may offer a good alternative to pop-up pools or track pans. Our 4" wall berms will have a higher capacity for spill and leak containment in large areas and start at 4 feet wide through to 15 foot. The lengths span 6' all the way up to 72' with up to 2692 gallon containment capacity. The variety of sizes can easily accommodate small machinery up to tanks or other large vehicles for routine equipment maintenance activities. From storing overpacks or portable drum containment to equipment wash down stations, the uses of foam spill containment berms are many. This versatile secondary containment system meets SPCC and EPA requirements. Open-cell foam block walls encased in Copolymer 2000 (25 oz. / sq. yard | Max. 160°F, Min. -25°F) or PVC (22 oz. / sq. yard | Max. 150°F, Min. -20°F) fabric materials. For more information please see our Containment Berm Chemical Compatibility Guide (PDF). 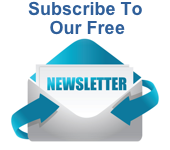 We are here to help if you have any questions about orders or shipping of our standard size foam berms or want information about custom sizes. Please contact us by email or call toll free (800) 869-9633. Note: Because our Foam Wall Containment Berms must ship LTL (less than load), we will email you upon receipt of your order to confirm exact shipping costs. Foam Wall Containment Berm - Dimensions: Inside - 4 feet wide x 6 feet long x 2 inches high. Outside – 6 feet x 7 feet 2 inches. Material: Copolymer-2000. Color: Black. Capacity: 25 gallons. Weight 24 lbs. Foam Wall Containment Berm - Dimensions: Inside - 6 feet wide x 8 feet long x 2 inches high. Outside – 8 feet x 9 feet 2 inches. Material: Copolymer-2000. Color: Black. Capacity: 55 gallons. Weight 30 lbs. Foam Wall Containment Berm - Dimensions: Inside - 8 feet wide x 10 feet long x 2 inches high. Outside – 10 feet x 11 feet 2 inches. Material: Copolymer-2000. Color: Black. Capacity: 88 gallons. Weight 38 lbs. Foam Wall Containment Berm - Dimensions: Inside – 4 feet wide x 6 feet long x 4 inches high. PVC 22 oz 24 mil. Color: Black. Capacity: 59 gallons. Weight 21 lbs. Foam Wall Containment Berm - Dimensions: Inside – 4 feet wide x 6 feet long x 4 inches high. Copolymer-2000. Color: Black. Capacity: 59 gallons. Weight 27 lbs. Foam Wall Containment Berm - Dimensions: Inside – 8 feet wide x 8 feet long x 4 inches high. PVC 22 oz 24 mil. Color: Black. Capacity: 159 gallons. Weight 40 lbs. Foam Wall Containment Berm - Dimensions: Inside – 8 feet wide x 8 feet long x 4 inches high. Copolymer-2000. Color: Black. Capacity: 159 gallons. Weight 45 lbs. Foam Wall Containment Berm - Dimensions: Inside – 10 feet wide x 10 feet long x 4 inches high. Copolymer-2000. Color: Black. Capacity: 249 gallons. Weight 61 lbs. Foam Wall Containment Berm - Dimensions: Inside – 10 feet wide x 10 feet long x 4 inches high. PVC 22 oz 24 mil. Color: Black. Capacity: 249 gallons. Weight 51 lbs. Foam Wall Containment Berm - Dimensions: Inside – 10 feet wide x 20 feet long x 4 inches high. Copolymer-2000. Color: Black. Capacity: 498 gallons. Weight 101 lbs. Foam Wall Containment Berm - Dimensions: Inside – 10 feet wide x 20 feet long x 4 inches high. PVC 22 oz 24 mil. Color: Black. Capacity: 498 gallons. Weight 83 lbs. Foam Wall Containment Berm - Dimensions: Inside – 10 feet wide x 30 feet long x 4 inches high. Copolymer-2000. Color: Black. Capacity: 748 gallons. Weight 137 lbs. Foam Wall Containment Berm - Dimensions: Inside – 10 feet wide x 30 feet long x 4 inches high. PVC 22 oz 24 mil. Color: Black. Capacity: 748 gallons. Weight 118 lbs. Foam Wall Containment Berm - Dimensions: Inside – 10 feet wide x 40 feet long x 4 inches high. Copolymer-2000. Color: Black. Capacity: 997 gallons. Weight 177 lbs. Foam Wall Containment Berm - Dimensions: Inside – 10 feet wide x 40 feet long x 4 inches high. PVC 22 oz 24 mil. Color: Black. Capacity: 997 gallons. Weight 150 lbs. Foam Wall Containment Berm - Dimensions: Inside – 10 feet wide x 50 feet long x 4 inches high. Copolymer-2000. Color: Black. Capacity: 1246 gallons. Weight 217 lbs. Foam Wall Containment Berm - Dimensions: Inside – 10 feet wide x 50 feet long x 4 inches high. PVC 22 oz 24 mil. Color: Black. Capacity: 1246 gallons. Weight 182 lbs. Foam Wall Containment Berm - Dimensions: Inside – 12 feet wide x 12 feet long x 4 inches high. Copolymer-2000. Color: Black. Capacity: 359 gallons. Weight 82 lbs. Foam Wall Containment Berm - Dimensions: Inside – 12 feet wide x 12 feet long x 4 inches high. PVC 22 oz 24 mil. Color: Black. Capacity: 359 gallons. Weight 63 lbs. Foam Wall Containment Berm - Dimensions: Inside – 12 feet wide x 16 feet long x 4 inches high. Copolymer-2000. Color: Black. Capacity: 478 gallons. Weight 97 lbs. Foam Wall Containment Berm - Dimensions: Inside – 12 feet wide x 16 feet long x 4 inches high. PVC 22 oz 24 mil. Color: Black. Capacity: 478 gallons. Weight 74 lbs. Foam Wall Containment Berm - Dimensions: Inside – 12 feet wide x 20 feet long x 4 inches high. Copolymer-2000. Color: Black. Capacity: 598 gallons. Weight 116 lbs. Foam Wall Containment Berm - Dimensions: Inside – 12 feet wide x 20 feet long x 4 inches high. PVC 22 oz 24 mil. Color: Black. Capacity: 598 gallons. Weight 88 lbs. Foam Wall Containment Berm - Dimensions: Inside – 12 feet wide x 30 feet long x 4 inches high. Copolymer-2000. Color: Black. Capacity: 897 gallons. Weight 159 lbs. Foam Wall Containment Berm - Dimensions: Inside – 12 feet wide x 30 feet long x 4 inches high. PVC 22 oz 24 mil. Color: Black. Capacity: 897 gallons. Weight 120 lbs. Foam Wall Containment Berm - Dimensions: Inside – 12 feet wide x 35 feet long x 4 inches high. Copolymer-2000. Color: Black. Capacity: 1047 gallons. Weight 184 lbs. Foam Wall Containment Berm - Dimensions: Inside – 12 feet wide x 35 feet long x 4 inches high. PVC 22 oz 24 mil. Color: Black. Capacity: 1047 gallons. Weight 138 lbs. Foam Wall Containment Berm - Dimensions: Inside – 12 feet wide x 40 feet long x 4 inches high. Copolymer-2000. Color: Black. Capacity: 1196 gallons. Weight 203 lbs. Foam Wall Containment Berm - Dimensions: Inside – 12 feet wide x 40 feet long x 4 inches high. PVC 22 oz 24 mil. Color: Black. Capacity: 1196 gallons. Weight 152 lbs. Foam Wall Containment Berm - Dimensions: Inside – 12 feet wide x 50 feet long x 4 inches high. Copolymer-2000. Color: Black. Capacity: 1496 gallons. Weight 249 lbs. Foam Wall Containment Berm - Dimensions: Inside – 12 feet wide x 40 feet long x 4 inches high. PVC 22 oz 24 mil. Color: Black. Capacity: 997 gallons. Weight 150 lbs. Foam Wall Containment Berm - Dimensions: Inside – 12 feet wide x 60 feet long x 4 inches high. Copolymer-2000. Color: Black. Capacity: 1795 gallons. Weight 293 lbs. Foam Wall Containment Berm - Dimensions: Inside – 12 feet wide x 60 feet long x 4 inches high. PVC 22 oz 24 mil. Color: Black. Capacity: 1795 gallons. Weight 219 lbs. Foam Wall Containment Berm - Dimensions: Inside – 12 feet wide x 72 feet long x 4 inches high. Copolymer-2000. Color: Black. Capacity: 2154 gallons. Weight 348 lbs. Foam Wall Containment Berm - Dimensions: Inside – 12 feet wide x 72 feet long x 4 inches high. PVC 22 oz 24 mil. Color: Black. Capacity: 2154 gallons. Weight 260 lbs. Foam Wall Containment Berm - Dimensions: Inside – 15 feet wide x 15 feet long x 4 inches high. Copolymer-2000. Color: Black. Capacity: 561 gallons. Weight 104 lbs. Foam Wall Containment Berm - Dimensions: Inside – 15 feet wide x 15 feet long x 4 inches high. PVC 22 oz 24 mil. Color: Black. Capacity: 561 gallons. Weight 86 lbs. Foam Wall Containment Berm - Dimensions: Inside – 15 feet wide x 20 feet long x 4 inches high. PVC 22 oz 24 mil. Color: Black. Capacity: 748 gallons. Weight 109 lbs. Foam Wall Containment Berm - Dimensions: Inside – 15 feet wide x 30 feet long x 4 inches high. Copolymer-2000. Color: Black. Capacity: 1122 gallons. Weight 182 lbs. Foam Wall Containment Berm - Dimensions: Inside – 15 feet wide x 30 feet long x 4 inches high. PVC 22 oz 24 mil. Color: Black. Capacity: 1122 gallons. Weight 148 lbs. Foam Wall Containment Berm - Dimensions: Inside – 15 feet wide x 40 feet long x 4 inches high. Copolymer-2000. Color: Black. Capacity: 1496 gallons. Weight 232 lbs. Foam Wall Containment Berm - Dimensions: Inside – 15 feet wide x 40 feet long x 4 inches high. PVC 22 oz 24 mil. Color: Black. Capacity: 1496 gallons. Weight 189 lbs. Foam Wall Containment Berm - Dimensions: Inside – 15 feet wide x 50 feet long x 4 inches high. Copolymer-2000. Color: Black. Capacity: 1870 gallons. Weight 281 lbs. Foam Wall Containment Berm - Dimensions: Inside – 15 feet wide x 50 feet long x 4 inches high. PVC 22 oz 24 mil. Color: Black. Capacity: 1870 gallons. Weight 230 lbs. Foam Wall Containment Berm - Dimensions: Inside – 15 feet wide x 66 feet long x 4 inches high. Copolymer-2000. Color: Black. Capacity: 2468 gallons. Weight 362 lbs. Foam Wall Containment Berm - Dimensions: Inside – 15 feet wide x 66 feet long x 4 inches high. PVC 22 oz 24 mil. Color: Black. Capacity: 2468 gallons. Weight 295 lbs. Foam Wall Containment Berm - Dimensions: Inside – 15 feet wide x 72 feet long x 4 inches high. Copolymer-2000. Color: Black. Capacity: 2692 gallons. Weight 393 lbs. Foam Wall Containment Berm - Dimensions: Inside – 15 feet wide x 72 feet long x 4 inches high. PVC 22 oz 24 mil. Color: Black. Capacity: 2692 gallons. Weight 320 lbs.